The Continental Divide Trail (CDT) spans 3,100 miles from Mexico to Canada. On the west side of the trail, rivers flow to the Pacific; to the east the Gulf of Mexico and Atlantic Ocean. A portion of this long trail passes through Berthoud Pass near Winter Park, Colorado. I like to hike small portion of the CDT trail in the morning hours. You can make it as long a hike as you want - just a few miles or 100 miles. From the parking lot atop Berthoud Pass, if you head west up the trail, you'll reach Russell Peak (12,391') and No Name Peak (12,424') after some uphill work, including a series of 14 switchbacks. But the sweat is worth it, for the views of the Fraser Valley leading into Winter Park, as well as the snow-draped edges of Vasquez Ridge, are stunning. You'll rarely see anyone up here early, and I like to reach the small summit for sunrise as first light peeks over the distant ridges. After 14 switchbacks up the Berthoud Pass portion of the Continental Divide Trail, this is the beautiful Colorado landscape that stretched out before you. 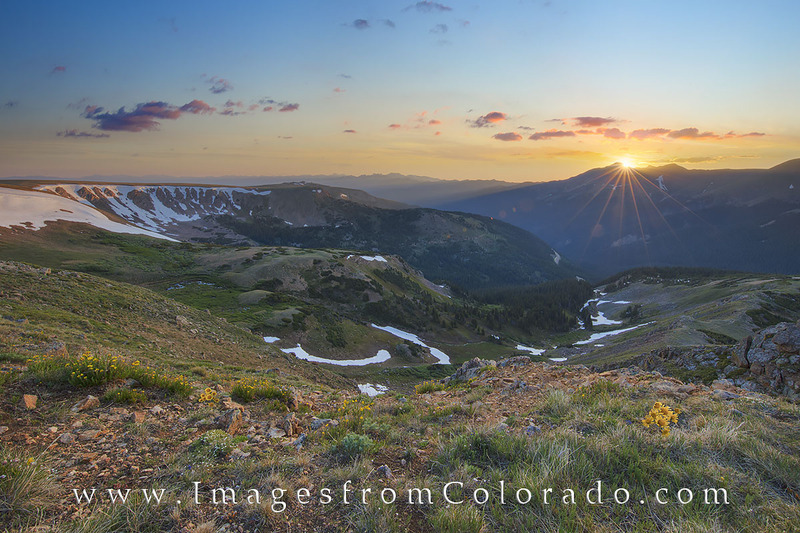 The sun rises over the distant peaks, and below Highway 40 winds its way down to Winter Park, then Fraser, then onto Granby. You can also branch off from the Continental Divide Trail and wind your way over to Mary Jane ski resort and the Winter Park slopes - all the while following the path along Vasquez Ridge. If you have any questions about these photographs of the Continental Divide Trail, please do not hesitate to contact me.